To Continue: Now, go back to the photo at the top. Obviously, this is NOT Joshua Bell. After reading this entry, do you think this man is really homeless, or is this photo created to make it look like he is homeless? Go look and come back. And also, no matter what your answer is, does the man in the photo look like he would stand out anywhere (with the homeless or anywhere), or that he would blend in with "the crowd"? In Tokyo, with more than 13 million people, you would not believe how many people know the homeless man in the photo above. His name is Hatori-san. The word "small" just doesn’t apply to Tokyo, but if you're in downtown, your odds of finding Hatori-san are surprisingly high. In fact, it's likely that he'll find you.. . and he's honest about what he's gonna buy with the change that you give him. 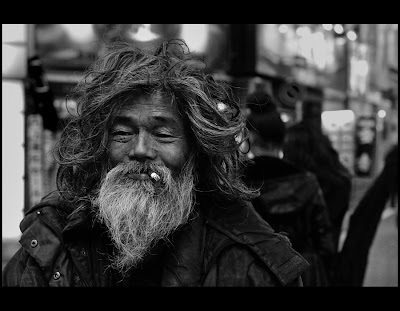 He's one of the few legendary figures who still lives on the streets of this world. You can spare a few yen for a smile. And today's song of the day is with Hatori-san, who appears in the official music video for Rhian Sheehan's "Standing in Silence Pt. 4".